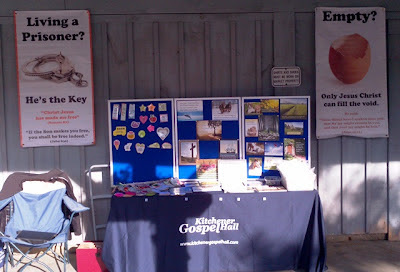 The Kitchener assembly has been going to the St. Jacob's Farmers Market for the summer months for the past two years. This market is well known for it's Mennonite background and people from all over the world come. The market has a location near the picnic table area reserved for charity groups. It is a very busy area and best of all it is free. 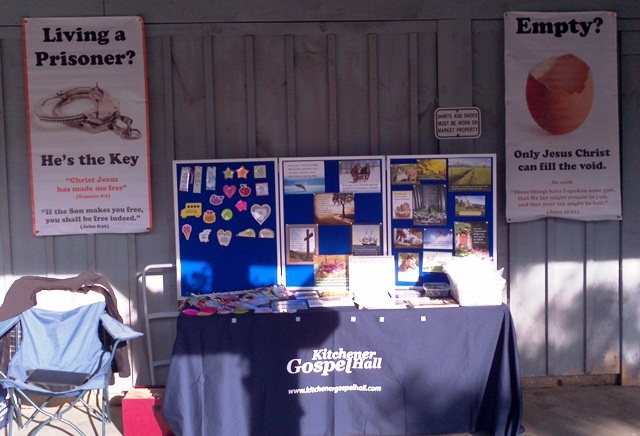 We go there every Thursday and put up a display with gospel texts, bookmarks and fridge magnets. The ladies in the Kitchener assembly work hard at making the bookmarks and fridge magnets. The texts are provided by the International Bible House. We take turns standing at the booth and there have been many opportunities to share Christ. Many people do not approach the table but most people will read the signs posted on the wall. We would value your prayers in this work and maybe there is a market near you that has a free location for charities! !